This installment of agoodrun is a bit different than the rest. 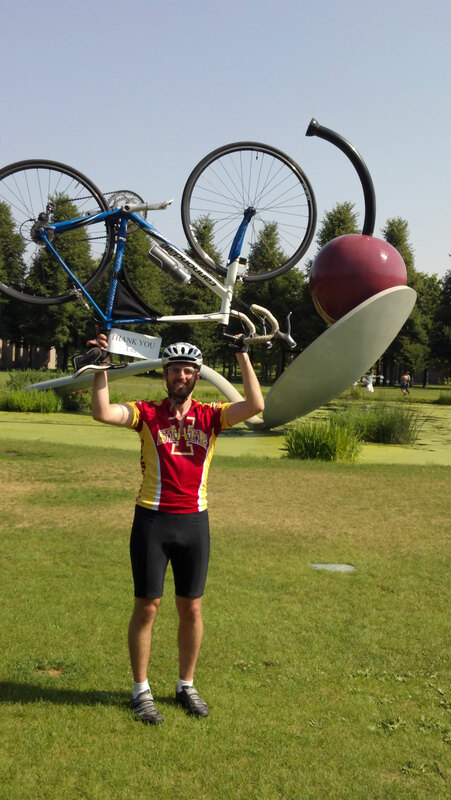 This ‘run’ was a 100 mile bike ride in the Twin Cities. At various times in my life I’ve considered myself a runner. I still run somewhat regularly with my wife and dog, but cycling always seems to be more enjoyable for me. Part of it is the ability to travel farther and faster which gets me to more varied and interesting places. I moved to the Twin Cities summer of 2010. Many people don’t know it, but Minneapolis was named the #1 Bike City in America by Bicycling.com in 2010. The area is littered with trails, many looping around the lakes that are abundant, many others taking advantage of the unused space next to train tracks that are equally abundant due to Minneapolis’ history of milling and shipping grain. 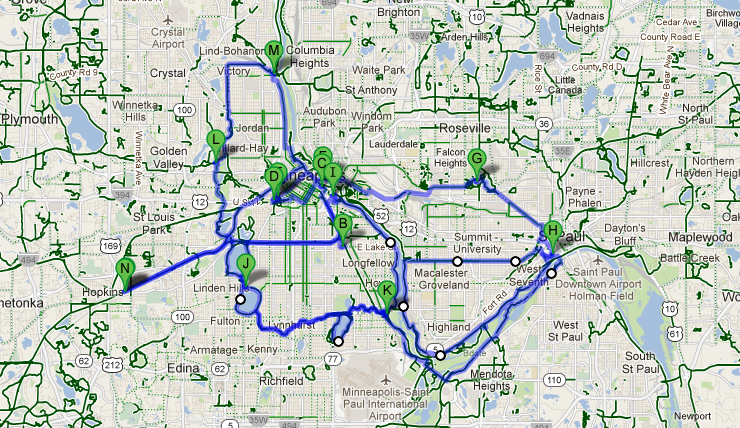 I knew if I was going to show off the Twin Cities, I would want to do it on a bicycle. Thankfully, Steve Good gave me the thumbs up. I decided to sign myself up for a 100 km ride, which after some peer pressure and enough people donating to my charity it got upped to what cyclists call a century, 100 miles. I raised money for Gems of Hope (www.gemsofhope.com). They are a charity that supports cancer patients and their families. It was founded by my mother and 2 other women in 2005. I started my ride where I start most all my rides, at the trail near my house. With a few cyclist friends, I took the greenway trail towards the uptown area. My first stop was at a NiceRide Kiosk. NiceRide is the bike sharing/renting system that is in the area. I highly recommend this to people touring the area. With a long layover at MSP you could even take advantage of these (Take the light rail to any number of these kiosks.) 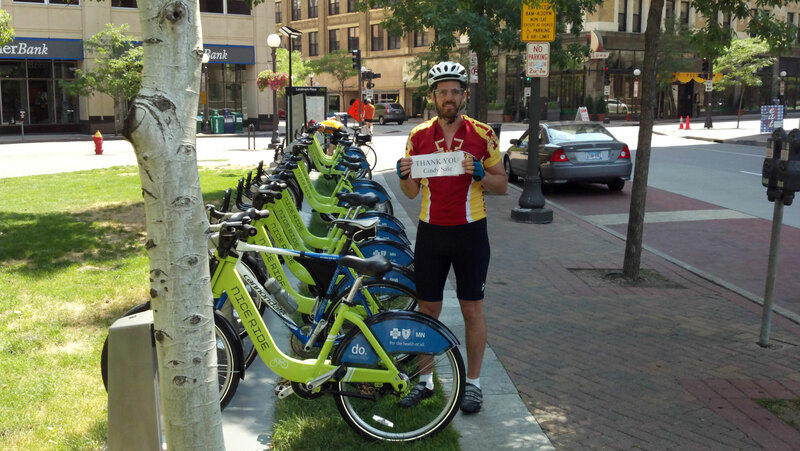 (https://www.niceridemn.org/ ). $6 gets you a day pass and as long as you don’t take any trip longer than 30 minutes that is your only charge – which with the number of these around it is very easy to keep trips under 30 minutes. Be advised though, after 30 mins the charges start racking up, so it is best to check in your bike at the nearest kiosk if you are close to the 30 minute mark and then check it back out if you have more riding to do. Here I thanked one of the people that donated who also happens to be one of the founders of Gems of Hope, Cindy Sale. 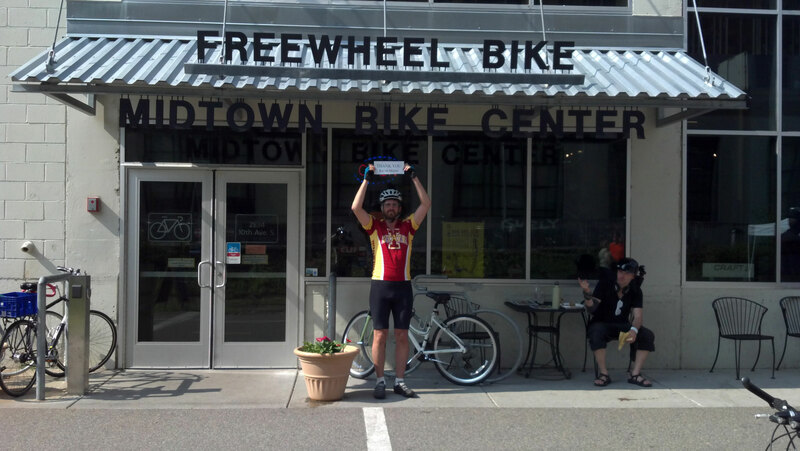 From there we rode the Hiawatha trail to downtown. Next stop was the Guthrie Theater (http://www.guthrietheater.org/ ). It is a very cool place for those interested in theater or architecture. One of the architecture highlights is the cantilevered lobby. This is a balcony that sticks out unsupported 178ft and has a really nice view of the Mississippi River. It is free to hop in and take a peek, I recommend it if you are in the area. Here I thanked one of my aunts-in-law, Floy. Floy was the first to donate and I appreciate her getting the ball rolling. Next stop was the Walker Sculpture Garden. It is a popular photo op. There are many other scupltures besides the cherry and spoon, although the cherry and spoon are clearly the most popular. Right across the street is the Walker Museum. Also a great spot to explore. Here I thanked my aunt-in-law, Lita. Just a block away from the Sculpture Garden is the Basilica of St Mary. It is America’s first Basilica. Its architecture is as impressive as its history. Here I thanked Nancy and Kerm, my parents-in-law that have welcomed me into their family. We headed across the river on the Stone Arch Bridge. The bridge used to be used for trains transporting wheat to get to the Minneapolis Mill that was on the Mississippi River, but currently is a pedestrian bridge. 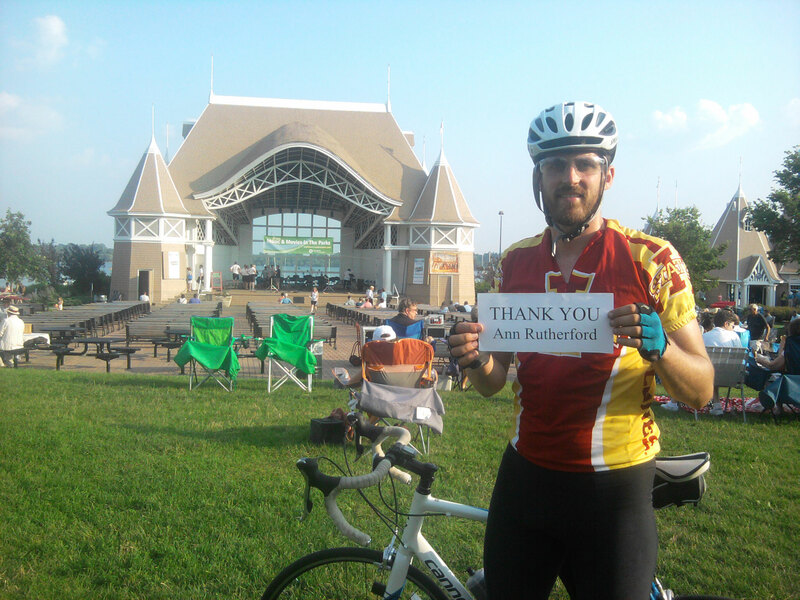 Here I thanked David Kasper, a friend from Cedar Rapids who I believe is just starting to get into or back into cycling. Since I was cycling 100 miles I decided I should take advantage of it and cycle farther than my normal routes would allow. 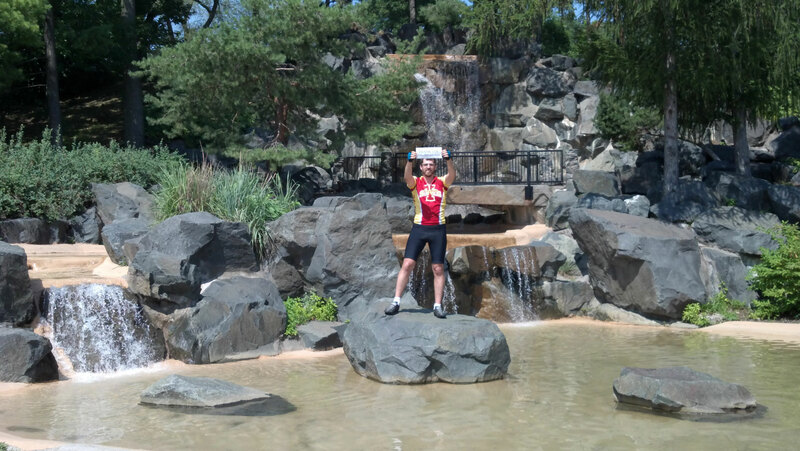 The next stop was the area that has Como Park, Zoo, and Lake. This is a very nice area in St Paul. The park is free with a recommended donation of $2. Here I chose to thank John Schnipkoweit, a friend from Cedar Rapids. While en route to downtown St Paul we found ourselves waiting for a train to pass. Across the street we saw a cyclist looking at his map. He came up to us and wanted to know if he could tag along. His name is Bob Bernstein from Maryland. 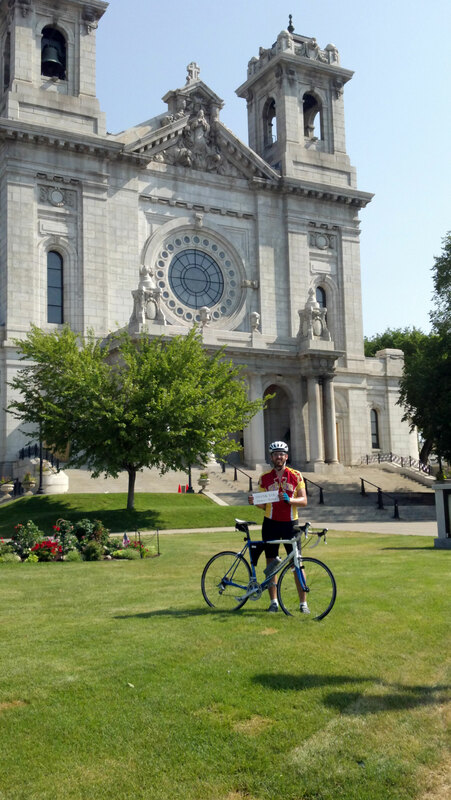 He was visiting the area before doing a multi-day ride from South Dakota to Wisconsin. I doubt he was expecting to find himself on a charity century ride when he started that day, but he was quite willing to join. 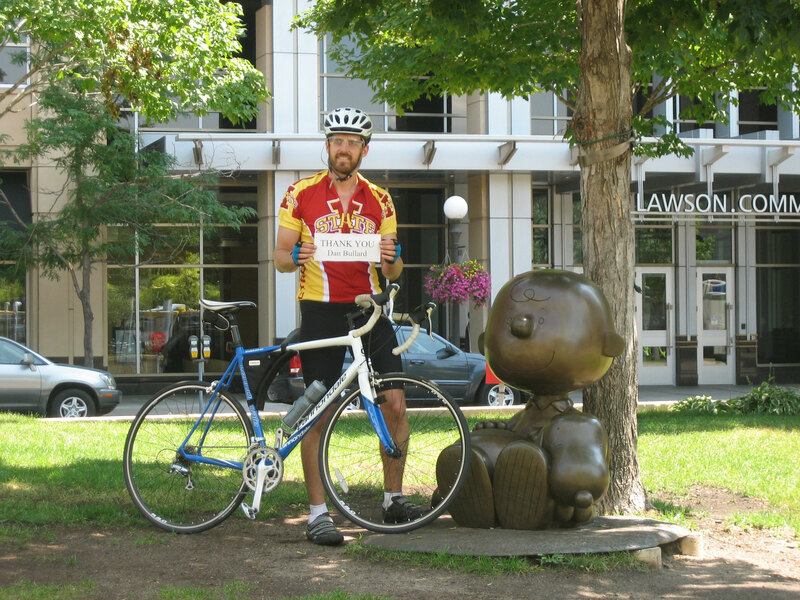 In downtown St Paul I chose to take a picture next to one of the many Peanuts (the comic strip) sculptures. The creator of the Peanuts, Charles Schulz, was born in Minneapolis and grew up in St Paul. There are multiple statues depicting his characters. 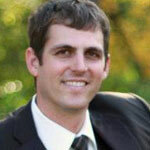 Here I chose to thank Dan Bullard. Dan was one of the key factors in the peer pressure to up my trip from 100 km to 100 miles. Besides being charitable, he also has a hobby of wrenching on old bikes. We had an unplanned stop at the St Paul farmers market to grab some food and drink before heading on the next portion of our trip. From here we rode the trail that follows the east bank of the Mississippi River. The original plan was to then loop back through St. Paul and then go up the trail on the west side of the river. As is often common, things didn’t go to plan. As if on cue not more than 3 minutes after telling a story of about a year ago when I broke a spoke, I broke another. With 60 miles to go and a wheel that was no longer true (it wobbled from side to side) we had to limp to the nearest bike shop. We took a long lunch while they corrected the wobble and put in a new spoke. A special thanks to Grand Performance for not charging me an absurd fee in my hour of need. 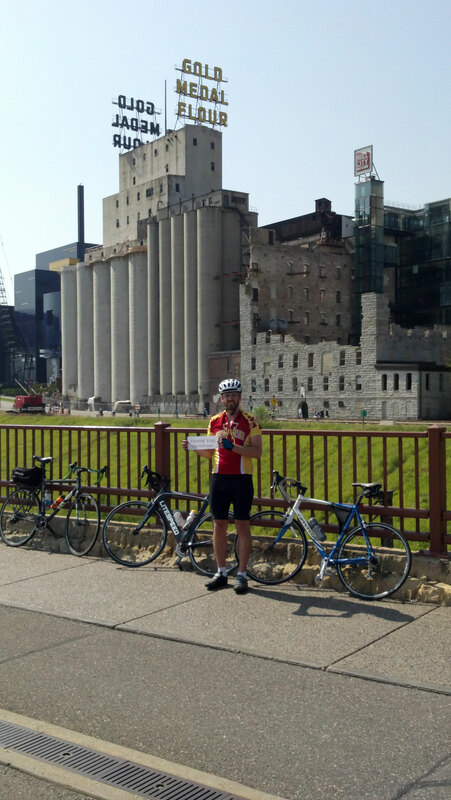 We finally got back on track and did our loop through St Paul and up the west side of the river. Oddly enough Bob knew the area better than the 3 of us from The Cities. All 3 of us live on the west side and none of us had ridden on that portion of the trail before and Bob had tagged along with another rider the day before. I think about this point Bob was starting to question what he got himself into. Our century was taking way longer than it should and we seemed to not have a firm grasp on where we were going. He stuck it out though either figuring that it could only get better or maybe it was like a trainwreck and he wanted to see how it would end up. The day was getting pretty hot so we took another break to fill up the water bottles. I can only imagine that I was looking especially good this day because for the second time a cyclist came up and joined our group. This time it was a man visiting from Memphis and he wanted directions to get back to St Louis Park, MN. We told him to follow us and we’d take him most of the way, then point him in the right direction. It is not a normal occurrence for me to pickup tag-a-longs, I swear. We made our way along the river towards downtown and stopped at Townhall Tap. Townhall Tap is a good restaurant that brews its own beers. The past decade has really been an explosion of craft brewing. I wanted to pick one of my stops to make note of the great brewing that is going on in the area, whether it be at a restaurant that brews its own like Townhall or a standalone brewery like Surly making excellent beers. 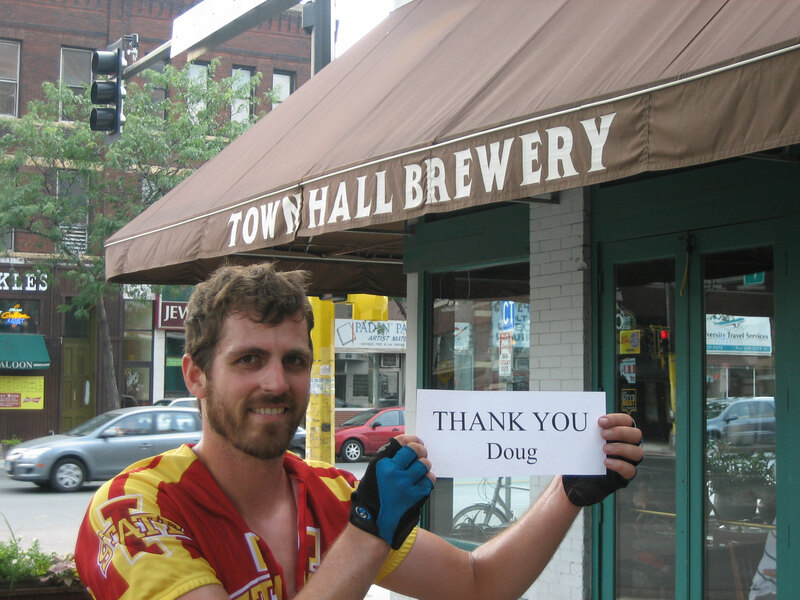 Here I thanked my brother Doug. I knew he would appreciate being the ‘sponsor’ of our beer stop. Heading back on one of the signature trails in the area, the greenway, we stopped at the Freewheel Bike Shop, a bike shop and a cafe in one right on the bike trail. Here I thanked another donor, Kevin Moore. Kevin and I met through a mutual friend and despite having met in person we’ve spent more time online discussing bikes, paddling, and geeky DIY projects. From there we headed around a few lakes to my favorite trail that follows the Minnehaha Creek and ends at the Minnehaha Falls. A very nice sight and nice park area to hang out. 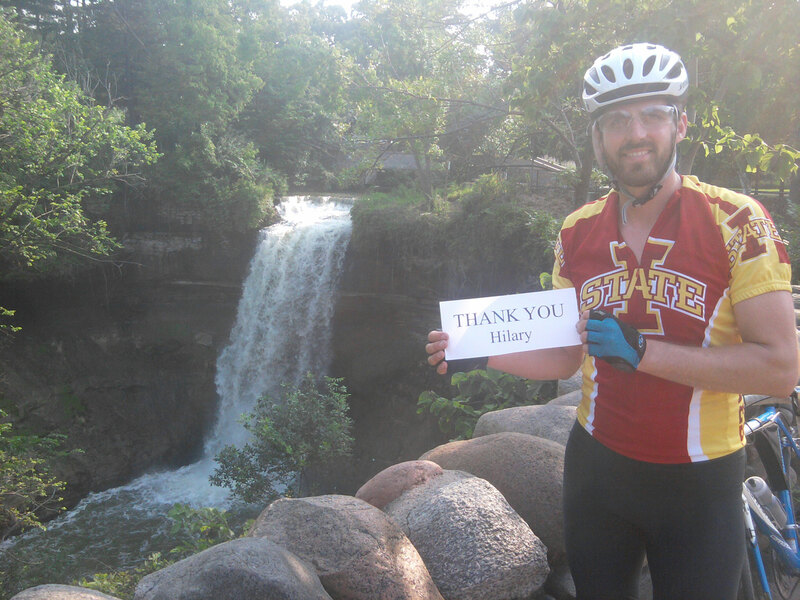 Here I thank my wonderful wife, Hilary. We went back on the trail and around the other side of the lakes stopping at Lake Harriet Bandshell. There are live music performances more nights than not in the summer here. It also was the spot that I had a nice bike stolen just a few weeks after moving to the area. It was definitely an event that made me pretty sour for a while, but it served as a lesson learned. Lock up your bike with a quality lock. Here I thank a college friend Ann Rutherford. Her donation was a nice surprise from my facebook solicitations. 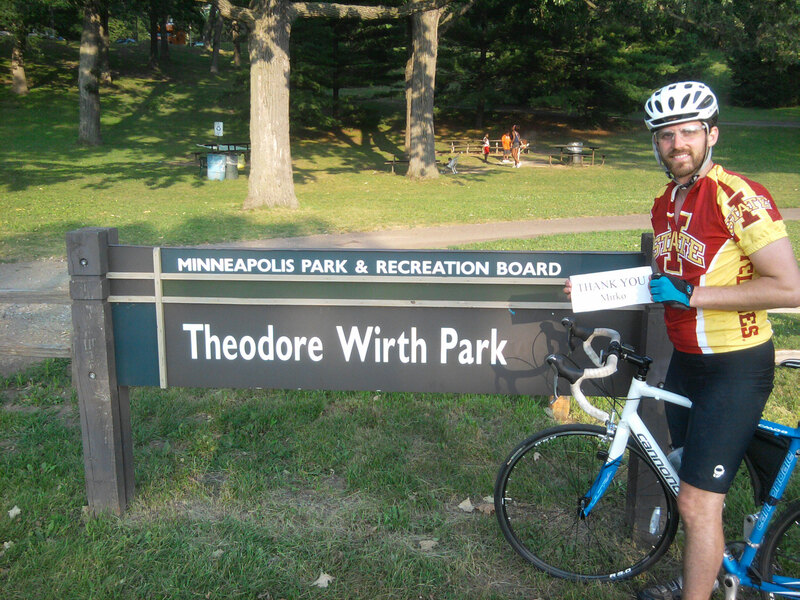 We then went on trail and residential streets to get to Theo Wirth Park. Theo is a very nice area with volleyball courts, picnic areas, golf course, and multiple running and mountain bike trails. This is my first year ever doing any mountain biking. I enjoy it despite not being very good at it. Here I thank a friend from Cedar Rapids, Mirko. We ended the trip at Pizza Luce. It is a fantastic pizza joint and it happens to have one of its restaurants within a few blocks of my place. 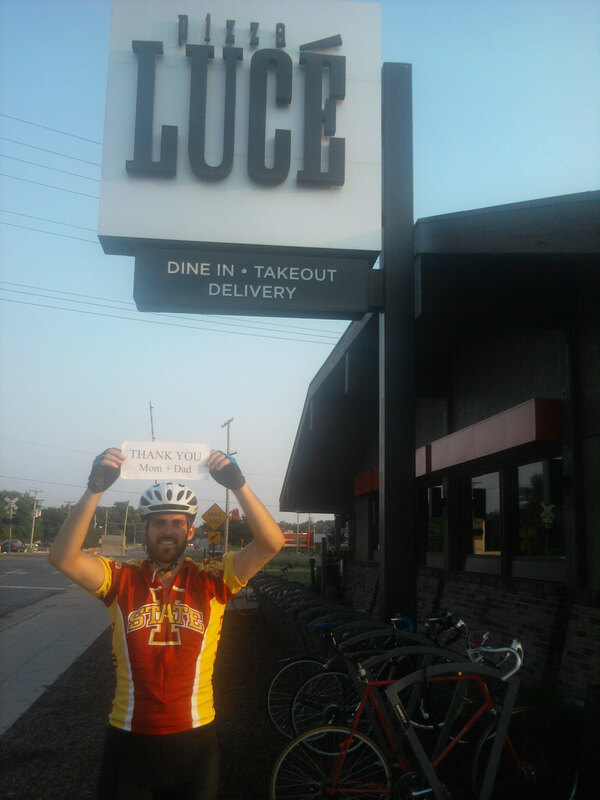 We decided to get ourselves a pizza to celebrate 102 miles on the bike’s odometer. Here I thank my parents Bruce and Beth. They had the mostly thankless, but appreciated, job of raising me. Love you both. 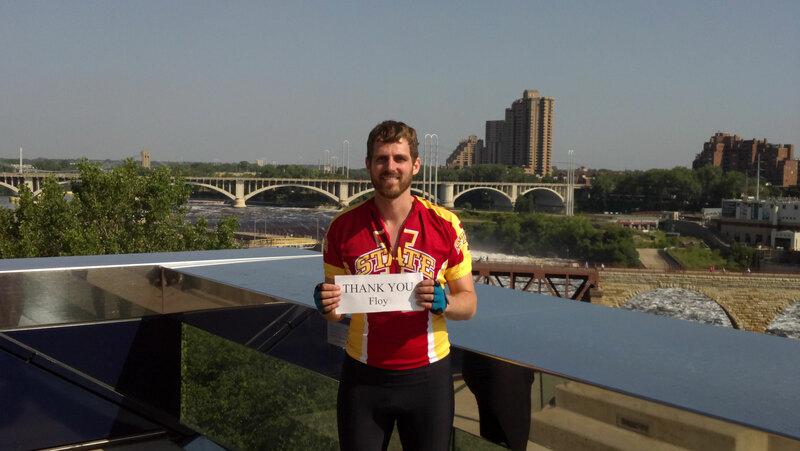 In addition to the many donors that I thanked above that helped me raise $375 for Gems of Hope, I also want to thank Andrew Kuncel and Scott Siegel for riding this with me.